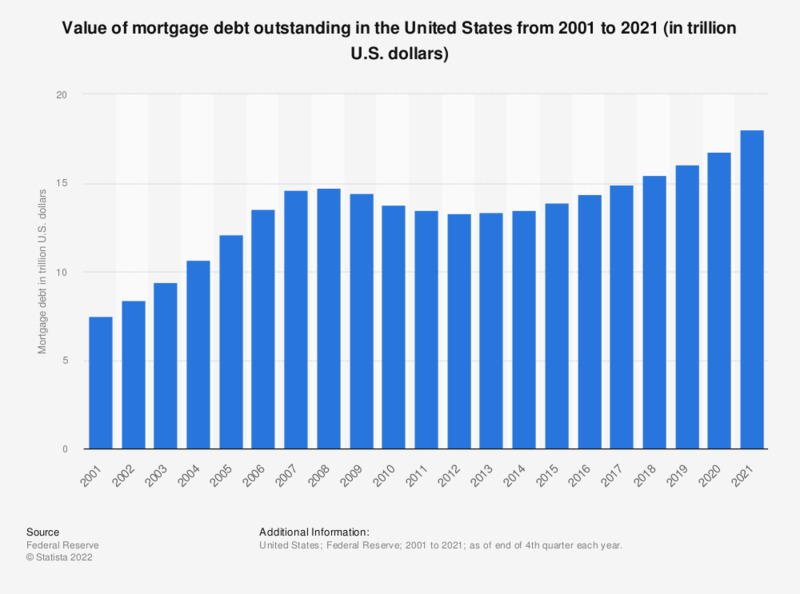 The statistic depicts the total mortgage debt outstanding in the United States from 2001 to 2018. The total mortgage debt outstanding in the U.S. amounted to approximately 15.4 trillion U.S. dollars in 2018. The amount of outstanding mortgage debt in the United States has decreased since 2008 making it appear that Americans are trying to reduce their debt and stock up on savings as a result of the economic crisis. While this may be true, decreases in mortgage debt can be mainly attributed to decreases in mortgage debt outstanding on family residences and not all of this debt reduction has come willingly. High numbers of housing unit foreclosures have likely reduced mortgage debt overall, in addition to mortgage debt restructuring and short-sales. The result of which would have had a great impact on mortgage debt overall, given the fact that household mortgage debt composes by far the largest share of household debt) and because the total value of mortgage debt in the United States is around 10 trillion U.S. dollars. However, it is not only mortgage debt that has contributed to this decrease, but also nonfarm and non-residential property has probably made a significant impact as well. In contrast, mortgages on multifamily residences and farm properties increase from year to year. Their value, however, is much smaller than the one of the previously mentioned debts and as such doesn’t have a big impact on the total value of outstanding mortgage debt in the U.S.
as of end of 4th quarter each year. Includes family residences, farm, nonfarm and nonresidential real estate. Over the last 3 months, approximately how much non mortgage debt (e.g. credit cards, loans) have you (and your partner) carried over each month in total? If your personal debt has increased in the last four years, has that been increased credit card debt, mortgage debt, school loans, a car loan, other personal loans, taxes, medical bills, or something else?